Many of your clients give to charity—no news there. But are those clients aware of the options beyond simple cash donations? Are they giving strategically? And are you using the charitable giving conversation to strengthen your relationships with them? Integrating strategic charitable planning into your client meetings presents an opportunity to provide valuable guidance on giving strategies, including tax-minimization techniques. These conversations can also give you greater insight into your clients’ lives and charitable motivations, helping you forge deeper, longer-lasting relationships. 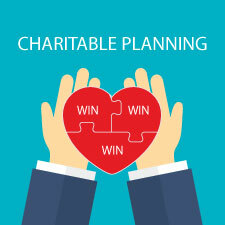 To help you add value with strategic charitable planning, here I’ll take a closer look at the goal of charitable planning, charitable deduction basics, and various charitable giving vehicles. Rather than giving cash, donating long-term appreciated assets allows your client to potentially eliminate capital gains taxes and take a full, fair-market-value deduction for the assets at the time of donation. Donating assets directly to charity (as opposed to liquidating them and donating the after-tax proceeds) means that more of your client’s gift can be put toward charitable purposes. There are complex rules surrounding charitable deductions, and it’s vital that your clients include their tax advisor in their planning. Still, there are a few basics when it comes to making charitable deductions. Now that we’ve covered the goal behind charitable deductions, let’s review the basics. 1) Gifts must be made to a qualified organization. Qualified organizations are defined by the IRS and include churches, synagogues, temples, mosques, and governments. All qualified organizations can be found on the Exempt Organizations Select Check Tool on the IRS website. 2) The maximum deduction is 50 percent of adjusted gross income (AGI). This applies to gifts made to public charities or private operating foundations (e.g., churches, certain educational organizations, hospitals, and some medical research facilities). Contributions made to organizations outside those categories are capped at 30 percent, including contributions to veterans organizations, fraternal societies, nonprofit cemeteries, and some private nonoperating foundations. Contributions of long-term capital gain property are capped at 30 percent if the property is given to a 50-percent organization and at 20 percent for organizations that do not qualify as 50-percent organizations. 3) Property contributions are generally valued at fair market value. Exceptions include short-term capital gain property, in which case the deduction is equal to the donor’s basis. The rules regarding valuation of property are complex. IRS Publication 561 offers a basic guide, but your clients should work with a tax professional (and possibly a valuation expert) to ensure that a proper deduction is taken. 4) Clients may carry over contributions that they aren’t able to deduct in the current year for up to five years, if they continue to itemize their deductions. But if your client is subject to the Pease limitation on itemized deductions, his or her charitable deduction may be drastically reduced. 5) Maintaining proper paperwork is essential to fulfill the IRS’s strict recordkeeping requirements. For cash contributions, your client needs a record reflecting the name of the organization, as well as the date and amount of the contribution (e.g., a check or credit card statement or a receipt from the organization). For noncash contributions, the requirements vary based on the contribution amount. In all cases, your client must maintain written records, whether a simple receipt or a detailed appraisal prepared by a qualified appraiser. Again, it’s vital to enlist a tax professional to ensure that requirements are met. Otherwise, your careful planning can quickly go to waste. Next, let’s look at some of the charitable giving vehicles available to today’s donors. Direct gifts. This is the most straightforward charitable giving option and may be made directly to a charity with cash, stock, or personal or real property. Pros: The charity can immediately put the gift to use. Cons: Your client must make individual donation decisions on an ongoing basis. Who’s a good candidate? Clients who want to make an immediate donation to a specific organization may prefer the simplicity of this option. Private foundations. These are nonprofit philanthropic organizations set up with a single primary donation from an individual or family. Pros: Your clients will have a high level of control over their giving, and the foundation can be tailored to satisfy particular charitable goals. Private foundations also allow for the involvement of many generations within a family. Cons: Private foundations are governed by a complex set of regulations and can be costly and burdensome to administer. Also, the annual contribution limits are lower for foundations than for many other charitable vehicles. Generally, donors can contribute cash gifts up to a maximum of 30 percent of their AGI; contributions of appreciated property can be made to a maximum of 20 percent of AGI. Who’s a good candidate? High-net-worth clients looking to make very sizable charitable gifts are best suited for this option. Charitable remainder annuity trusts distribute a fixed annuity amount each year, and additional contributions are not allowed. Charitable remainder unitrusts distribute a fixed percentage based on the balance of the trust assets (revalued annually), and additional distributions can be made. Both are an irrevocable transfer of cash or property and are required to distribute a portion of income or principal each year, to either the donor or another beneficiary. At the end of the specified lifetime or term, the remaining trust assets are distributed to a charitable remainder beneficiary. Also, keep in mind that income distributions to the noncharitable beneficiary are taxed based on the four-tier system: (1) ordinary income, (2) capital gains, (3) tax-free income, and (4) return of principal. Pros: Although gifts to charity in which the donor retains a partial interest are not generally eligible for income tax, gift tax, or estate tax charitable deductions, charitable trusts are an exception. Charitable remainder trusts allow the donor to receive income from the trust for his or her lifetime, the lifetime of another, or a period of up to 20 years. Cons: Ongoing administration is required. Who’s a good candidate? Clients who wish to realize the immediate tax benefit of making a charitable donation but also have a need for an income stream may be especially interested. The annual annuity or unitrust payment may be used during the donor’s lifetime to benefit the donor or another individual, or the trust may be established at death to provide for an heir and subsequently pass the remainder to a charity. A nonreversionary lead trust names someone other than the grantor as the remainder beneficiary, and there is no federal income tax deduction upon its creation. Pros: The trust itself receives an income tax deduction for the income payments made to charity, and the trust is taxed only on the amount of income above the charitable distribution. Because the assets don’t revert to the grantor, they are removed from his or her estate and a completed gift is made, allowing the donor to take a charitable gift tax deduction for the present value of the distributions being paid to the charity. Cons: The present value of any remainder passing to the donor’s heirs is subject to gift tax. Who’s a good candidate? This is ideal for a client with charitable intent who also wants to pass appreciating property to heirs and reduce gift and estate tax consequences. A grantor lead trust reverts to the grantor or his or her spouse as the remainder beneficiary. Pros: The trust qualifies for an immediate income tax deduction based on the present value of the annuity or unitrust payments to the charitable institution. Because the assets remain in the grantor’s estate, there is no gift tax consequence. Cons: The grantor must pay income tax each year on any income generated by the trust, including the income paid to the charitable institution. Who’s a good candidate? Clients who need an immediate charitable deduction but want to retain control of the gifted assets may be interested in this trust. Donor-advised funds (DAFs). A low-cost alternative to a private foundation, a DAF is a charity established to distribute funds to other charities. A DAF contribution is generally tax-deductible in the year that it’s made. Typically, the maximum deduction is capped at 50 percent of the donor’s AGI if cash is donated. If a donation of highly appreciated assets is made, the deduction is typically capped at 30 percent of AGI. Pros: Donors make charitable gifts to the fund throughout their lifetime and can make suggestions regarding the distribution of assets to specific charities. DAFs can help your clients maximize their charitable giving by letting assets grow tax-free until a grant recommendation is made. Cons: Your client won’t maintain control of the donated assets. Who’s a good candidate? A DAF may be an excellent vehicle for those clients with moderate to large amounts of capital. They can use these funds to make last-minute charitable contributions, locking in an immediate deduction and later deciding how the funds should be allocated. Charitable giving plays a large role in many mid- and high-net-worth clients’ financial plans. With strategic charitable planning, you can help ensure that your clients find an appropriate vehicle to carry out their charitable intentions. Plus, talking with clients about their goals and the various strategies available to facilitate giving adds real value, helping you capture more of their investable assets and building stronger relationships that may span generations. Do you include the charitable giving discussion as part of your client meetings? What charitable giving vehicles are most popular with your high-net-worth clients? Please share your thoughts with us below.